Initially conceived as a sound piece, this short is inspired by the relationship between an environment and sound. I visited the historic building 1520 and videotaped the surrounding neighborhood from its entrance. I used MIDI (in Garage Band) to mimic the skyline, high plane high tone low plane low tone. The sound required a visual guide since it was influenced by a visual experience. 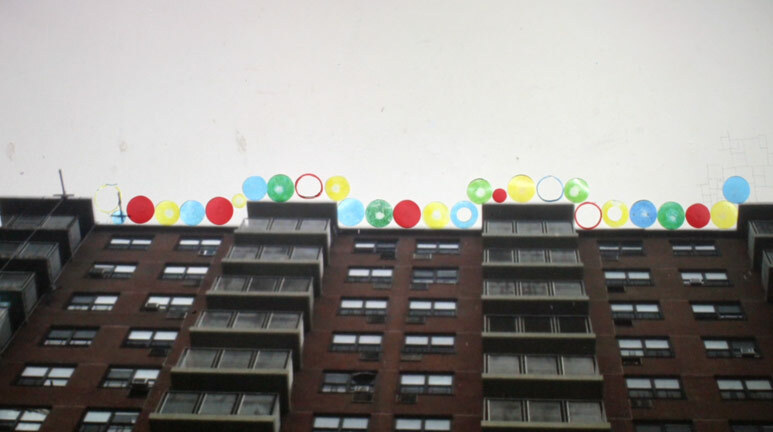 I projected the video footage onto a wall and used pieces of hand colored circular paper to trace the skyline. Still photographs of their progression were combined with the MIDI sound to complete the piece.